Until recently Dianna Agron was mostly known for sitting atop a pyramid of Cheerios as reformed ice queen Quinn Fabray on Glee. But this month the actress brings her talents to the big-screen with sci-fi adventure I am Number Four (also starring Alex Pettyfer, Callan McAuliffe, and Teresa Palmer). The busy 24-year-old found time to chat with Teen Vogue about hitting the road (again) with New Directions, her upcoming storyline with Lea Michele, and her not-so-secret music addiction. What was it like working on your first blockbuster film? I am Number Four was awesome. I felt like I knew everyone on the cast and crew personally so sometimes I forgot what a huge film we were making. Did you have to do any stunts? I had to fall off a four-story building! I was in a harness and wearing clothes two sizes larger than usual--I felt like the Michelin Man! It was fantastic. I'm not afraid of heights, so that helped. You're a music junkie. What do you look for when scoping out new artists? Different things. Sometimes it's a band that I just come across on MySpace or other times I'll hear a new album by someone I've known for a long time. For instance, I've always loved Adele and she really blew me away with her new album. I've been listening to it on repeat. People always say, "If you were to be stranded on a deserted island what's the one thing you couldn't live without?" Well, for me it would be music. 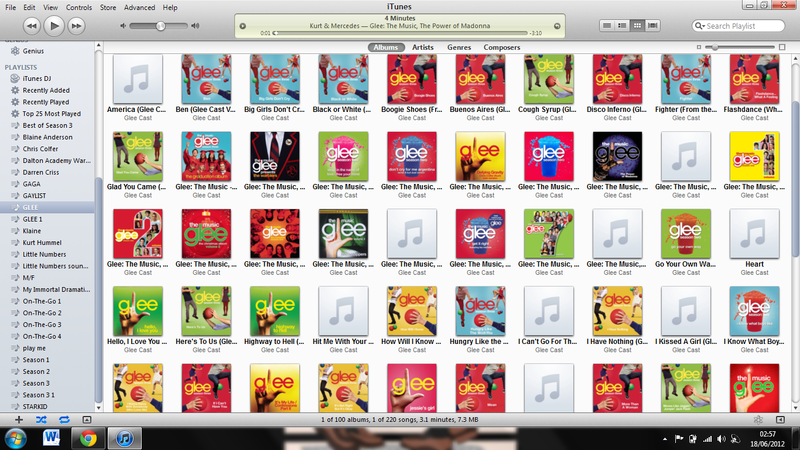 I had to put a playlist together recently, and I felt like I was betraying my iTunes collection! It was impossible! What is your go to song when having a bad day? I love Tom Watts "All the World is Green." It really speaks to me. The lyrics are so beautiful. Can you tell me what is in store for Quinn on Glee? Right now, I'm working on some large comedic scenes. When I first read the script I thought she was being so mean to Rachel (Lea Michele) and I felt awful--until I realized it was all a joke. Was your high school experience anything like McKinley High? For me it was pretty tame. Of course there was bullying and cliquey groups. There will always be stereotypes both on and off screen. It was the best and worst of times, but you have to make the most of it. Find what makes you happy and stay away from the things that don't. Are you excited to hit the road again with the Glee tour this summer? I don't know any details, but I think it will be a completely new show. Last year, we couldn't have predicted the level of excitement from our fans. They would follow our bus and chase us in cars. The whole experience feels surreal, like I am sneaking into someone else's performance. Adele's "Rolling in the Deep." It's my anthem at the moment. To teleport. It would cut the travel time down-- I could take a half-day trip to China! Extremely Loud and Incredibly Close by Jonathan Safran Foer.